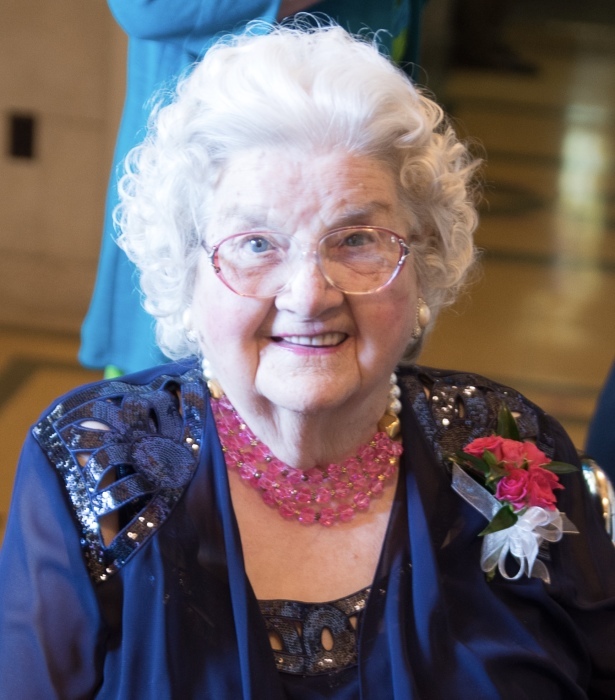 Mary Sophie Kozicki (Grabowski) passed away peacefully and went to be with Jesus on Monday, May 7th at the age of 96. She was born on January 15, 1922 to Wiktorya and Ludwig Grabowski in Wilmington, Delaware. She was predeceased by her husband, Adam Kozicki in 1983; her siblings, Franciszek Grabowski , Edward Grabowski (Adele), Evelyn Wisniewski (Stanley) and Anthony Grabowski (Ceil); and her beloved in-laws, Florence and Stanley Kozicki, Henry Kozicki (Ann), and Helen Czerwinski (Frank). Our Mother and Babci will be sadly missed by her loving children Paul Kozicki, Stan Kozicki (Joan), Mania Chrzanowski (John), Larry Kozicki (Gina); grandchildren, Chris Kozicki (Anne), Mary Kate Mieczkowski (Bobby), Matt Kozicki (Trish), Lauren Edgar (Dan), Elizabeth Narasaki (Mike), and Adam Kozicki; and 10 great-grandchildren, Michelle, Sean, Kevin, and Johanna Kozicki, Colin and Ella Kozicki, Noah and Nathan Narasaki, Mary Abigail Mieczkowski, Shane Edgar, and Baby Edgar due any day; her sister Helen Kaminski (Walter), and numerous nieces and nephews who loved their Ciocia Mania dearly. Mary lived her life with a strong devotion to her Catholic faith being a lifelong member of St. Hedwig Catholic Church, being married there, and raising her four children in the Catholic faith. She attended Mass daily, loved her Sunday high Mass, benedictions, May processions, and devotions. Her deepest devotion was to the Blessed Mother, always praying the Rosary, and belonging to St. Hedwig Holy Rosary Sodality. During her lifetime, she enjoyed numerous bus trips to Lodi, Our Lady of Czestochowa Shrine, and train rides to visit her extended family in Newark, New Jersey. Mary loved cook outs, bingo, the Polish festival, and especially dancing the Polka. Her favorite trip was to Poland, where she kissed the ground when she landed. She raised her children with unconditional love and protection, always helping at school, chaperoning trips, and enjoying all of their childhood friends who called her Pani Mary. She loved cooking Polish meals and her specialties were platski , homemade bread, and paczki. While living on Harrison Street, Mary worked at Radulski’s Bakery where she called everyone “angel”. After moving up the hill to Sycamore Street, she worked weekends at St. Elizabeth’s Rectory cooking and ironing for the priests, where she definitively was in her glory. Sewing her own clothes and crocheting afghans was always a priority. The great grand-children cover up with these afghans and call them their “Babci blankets”. The Loves of her long Life were truly her grandchildren. Babci loved babysitting her grandchildren and never missed a party or school event. She so enjoyed taking walks with her grandchildren and put miles on numerous strollers! She adored trips to Rehoboth with her family, walking the boardwalk, feeding the ducks, and soaking her legs in the ocean. She walked to Church and attended daily Mass during her stays in Rehoboth. Taking the auto train to Disney World will never be forgotten, she never slept nor did anyone else in her train car. Babci never drove, but loved to walk until she was stricken by a stroke in 2010. Her health since then was compromised by a broken hip, pneumonia, and a second stroke in 2015 which took her speech away. She faced her hospitalizations with grace and dignity. She was a strong matriarch for our family and never complained or missed a step, even in her wheelchair. A day will not go by, that we won’t remember our Beloved Mother and Babci. She, indeed, will always be watching over us. Heaven has gained our “Angel”. Special thanks to the staff at Regal Heights for their compassion and care to our Mother and Babci, and treating her like their own. Visitation will be on Sunday, May 13th from 5-7pm, Doherty Funeral Home on Limestone Road. A Mass of Christian burial will be celebrated on Monday, May 14th at 11am, St. Hedwig Catholic Church, 408 South Harrison Street, Wilmington, Delaware 19805. Burial will follow in Cathedral Cemetery. In lieu of flowers, the family requests donations to St. Hedwig Catholic Church.